Hey everyone, Donogh here again. In this blog, I’ll talk about the importance of an individualised program to reach your goals. One of the services provided here at PFP is an assessment through Functional Movement. Based on your results and your needs we then design a program. The aim of this is to turn your weak links into less of a weak link while also focusing on the importance of turning your strong links into even stronger links, therefore it is important to have an individualised program. We are all different, two people may have the same goals but they will have completely different strengths and weaknesses. Through the assessment we also get a picture of your lifestyle and other factors that can affect your training such as work, nutrition and sleep. Again, no two people will be the same here. I have worked a lot with various rugby teams and I have seen first-hand a one size fits all approach, in reality it’s a one size fits some. Through the assessment we can identify where you have issues in your mobility or stability while also checking previous injuries and then implementing corrective strategies individual to you. These strategies will make your movement better, reduce your risk of injury and give you a better chance of your program being a success. My most used phrase as a coach is “it depends”, it always depends on something. “How do I get stronger?”. It depends on what you have done before, injury history or movement quality. “How do I get fitter?”. It depends on your body composition, nutrition or sleep quality. Hopefully that gives you an insight into the importance of individualised training and if you have any questions call in and have a chat with any members of staff here at PFP. Hi everyone, Coach Ev here at PFP. Whether you’re an athlete, fitness fanatic or new to the gym life, getting the most from your experience is vital in order to keep you motivated and help you achieve your goals. So here are my recommendations to help you get the most from your experience. Gyms are not one size fits all. There are many different gyms out there to cater for various needs. Finding the right gym for you is vital for your success. Choosing the right gym can seem like a difficult task. Do some research on them. Check out their website. Make an appointment to come in and chat with the staff about your goals. Some gyms cater specifically for weight training, fitness based classes, personal training, Powerlifting, Olympic Lifting, team conditioning or even pay as you go. (FYI - PFP Gym caters for all of the aforementioned!) The gym you choose will determine the experience you have. And this really can be the difference between you achieving your goals and giving up. Talk to the staff and get the blunt facts! Find out what each place offers and what qualifications and experience the staff have. Set yourself both long and short term goals. Make sure that your goals are SMART - specific, measurable, achievable, realistic and time based. An example of poor goal setting is - 'I want to squat more', 'I want to be thin', 'I want to get fit' - none of these are SMART. How will you ever know if you have achieved your goal? You won't! Goals like these set the individual up for failure and they end up giving up. Good goal setting might sound like the following 'I want to squat 5kg more in 4 weeks time', 'I want to lose 10 lbs in 8 weeks' or 'I want to run 10km without stopping by the end of the year'. Be mindful of your goals. Think about what you really want to achieve. Be realistic. And reflect every so often to assess how you are progressing towards the goal. A great way to see real improvements is to get yourself a diary. Write in everything you eat and the times you eat at, your work schedule, training schedule and how your mood is from day to day. Yes, I know it’s quite a bit to keep track of, but you’ll clearly be able see if eating certain things impact your mood/ training/ work state. This will help to keep you motivated and it can help to determine any nutrition issues. Another benefit of a food diary is the accountability factor - seeing what you are eating in black and white can be an eye-opener for some people. The fact that you are recording everything that you eat means you are less likely to eat mindlessly throughout the day. If writing down everything isn't your thing, there are plenty of apps that allow you to record food intake online. Don't be afraid to ask questions when training. A good coach will not only explain how to do something, but will also explain WHY you are doing it. Learn about different exercises and build your own knowledge. From time to time, your coach may need to alter your program based on your physical capabilities. This is done to ensure that you are getting the most from your training. Be ready for your coach to correct your form - it's not a criticism! Good form is crucial to prevent injury and to make sure you are getting the most form your session. So, those are some of my tips when trying to get the most out of your gym experience. Any questions don’t be afraid call in and ask. Can exercise help you beat anxiety? We all know how good working out is for our physical health, so let's start a conversation today about the benefits of working out for your mental health. Exercise is underutilized as a method of managing and treating anxiety. It has no negative side-effects and it can be free, if you do it at home or outside. Several studies have shown that there is a very powerful connection between exercise and anxiety. In fact, the coloration between both is so strong, that exercise on its own may be enough to drastically diminish the symptoms of anxiety. How can exercise do this? 1. Endorphins - the body releases endorphins when you exercise. These are your body's natural 'painkillers', and in addition they play a massive role in regulating your mood and relaxing your mind. You know that 'feel good' feeling after a workout ? Yep! That's the endorphins. 2. Sleep - exercise tires out the body and can enable those who have anxiety to get a better night's sleep. A lack of sleep, or inability to sleep, makes the symptoms of anxiety worse. Exercise can release all of the excess energy in the body and mind - in fact, high intensity exercise has been shown to tire out the body and the mind simultaneously. 3. Inactivity anxiety - a lack of exercise can lead to an excess of energy and this energy can be misplaced by the body, resulting in increased tension and stress. An increase in stress levels can exacerbate anxiety. This is very much linked with the above point on sleep. A lack activity can feed into a lack of sleep, and together both of these elements can accumulate and worsen the symptoms of anxiety. 4. Healthy coping strategy- managing anxiety through exercise is a healthy coping strategy. Sometimes we turn to things like alcohol to manage anxiety. But the consumption of alcohol, as a coping strategy, will usually have a negative impact on anxiety and will often lead to a worsening of symptoms. Exercise, on the other hand, is a positive means of dealing with anxiety with lots of additional benefits such as improved overall health. If you are in a gym or a group, such as a running group, the camaraderie and friendships can be an additional support in managing anxiety. So that's it - a brief overview of how exercise can help to cope with and manage anxiety. In the long term, a regular exercise schedule can dramatically alleviate the symptoms of anxiety. If you, or someone you know, is suffering with anxiety, please do seek medial advice - medication is may sometimes be necessary, but exercise can, and should, compliment it. When we have pain, the usual reaction is to assume some sort of injury or issue at the site of the pain and so we normally set about getting treatment to this area in order to eliminate the pain. But this may not be the only answer to your problem. Treating the site of the pain is fine, but the site is not necessarily the primary source of your discomfort. Many people don't know that a dysfunction at one joint can cause over-use at another, and eventually lead to injury. The body is just like a stack of joints. Each joint has a specific function and if it fails to do its job, then the joint above or below must pick up the slack. This can lead to injury. So what are the functions of our various joints? The ankle’s primary job is mobility, the knee’s function is stability, the hip is concerned with mobility, the lower back’s purpose is stability and the upper back is mobility. If you are getting a common pain - such as knee pain, where might it be coming from? There are many potential answers to this, but it could very well be that your ankle or hips (or both!) are lacking in mobility meaning that your knee has had to compensate for this, and so resulting in knee pain. I regularly get asked about the difference between mobility and stability with regards to joints - mobility is the ability of the joint to move through a preferably full range of motion; stability on the other hand is the opposite. A stable joint needs to resist motion; not produce it. If your hips or upper back fail to move properly, your lower back will become mobile. So when your lower back is in pain, it can be due to a lack of range of motion in the hips or upper back. Bottom line is that if you are in pain - STOP. Pain is a sign something is wrong and you shouldn't try to train through it. 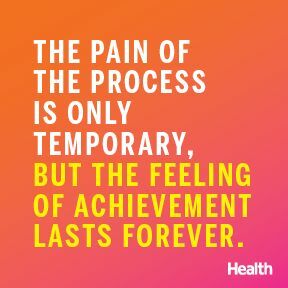 That's why I particularly DESPISE the sort of quotes bandied about below - they perpetuate the idea that you should be in pain in the gym . Let's be clear - you shouldn't be in pain. Yes, it may be uncomfortable and sore; you may feel 'the burn', but actual pain in any joint or muscle shouldn't be happening! If an exercise hurts, then don’t do the exercise. With an appropriate gym program you can train the joints to enhance mobility and stability and to then eliminate any joint pain you may be experiencing. As always please get in touch if you have any questions - I'm more than happy to help.